As part of our fiftieth anniversary celebrations, the Society’s next newsletter includes a timeline highlighting some of the events in and additions to the Capitol since 1962, the year USCHS was founded. Obviously we couldn’t include everything, so here are a few of the pieces of art that didn’t make the cut (and one that did—check out the newsletter in June to see which!). All of these statues are part of the National Statuary Hall Collection, to which each state can contribute two statues. The legislation authorizing the collection was passed in 1864, but it wasn’t until 2005 that 100 statues had arrived in Washington. Even now, the collection is in flux; legislation from 2000 allows a state to replace an already-donated statue with a new one. Many of the statues can be seen during a visit to the Capitol Visitor Center and a tour of the Capitol, or you can learn more about them on the Architect of the Capitol’s website. John Burke (1859-1937) was born in Iowa but made his name in North Dakota as a lawyer and then judge. He served in the state legislature and then as governor (1907-13). He was renowned for his integrity and reformed North Dakota’s political system as well as supporting progressive reform measures, including child labor and sanitation laws. Woodrow Wilson named Burke US treasurer in 1913 (he served until 1921), and Burke was later elected to the Supreme Court of North Dakota. Joseph Ward (1838-1889) arrived in the Dakota Territory in 1869 as a missionary; he soon opened a school as well, which eventually became the first high school in Dakota. Ward helped found the first collegiate-level institution in the upper Mississippi area as well as the Dakota Hospital for the insane. A strong supporter of South Dakota statehood, he attended many statehood conventions, helped present the statehood petition to Congress, and played a key role in drafting the state constitution. Dennis Chavez (1888-1962) was born in New Mexico and eventually represented the state in Congress. He first came to Washington as a senator’s Spanish interpreter and graduated from Georgetown University Law School. After practicing law in Albuquerque and serving in the New Mexico House of Representatives, he served several terms in the U.S. House before being appointed to the Senate in 1935 and winning the 1936 election. He held the seat until his death. Chavez supported the New Deal as well as the rights of American Indians and Puerto Ricans. King Kamehameha I (1758?-1819) was a Hawaiian warrior who eventually united all the inhabitants of Hawaii under his rule, which brought an end to wars amongst Hawaiians. During his rule, he encouraged trade and opened Hawaii to the world. This statue is a copy of one first modeled in Rome in 1879, which now stands outside the Judiciary Building in Honolulu, and is one of the heaviest in the collection. A native of Washington state, Edward Lewis Bartlett (1904-1968) graduated from the University of Alaska in 1925 and stayed for a career in journalism and then politics. He served as a delegate to Congress for the Alaska Territory, worked hard for Alaskan statehood, and was the first senator from Alaska when it became a state in 1959. According to a Library of Congress estimate, he had more bills passed than any other member of Congress in history. Any recently added Capitol artwork that you’re particularly fond of? Let us know in the comments and we’ll consider featuring it in a future post! Fifty years ago John F. Kennedy was in the second year of his presidency, the Beatles released their first single, Wilt Chamberlain scored a record 100 points in a professional basketball game, Nazi war criminal Adolf Eichmann was executed in Israel, the first Walmart store opened, film star Marilyn Monroe died, the Cuban Missile Crisis threatened to turn the Cold War hot, and the United States Capitol Historical Society was founded. On July 17, 1962, fifteen men and women met in the United States Capitol to establish the United States Capitol Historical Society. The meeting had been called by Representative Fred Schwengel, who had represented Iowa’s First District since 1955. The meeting marked the beginning of a new historical society, but it was also only part of a chain of events that began with Representative Schwengel’s initial interest in history. 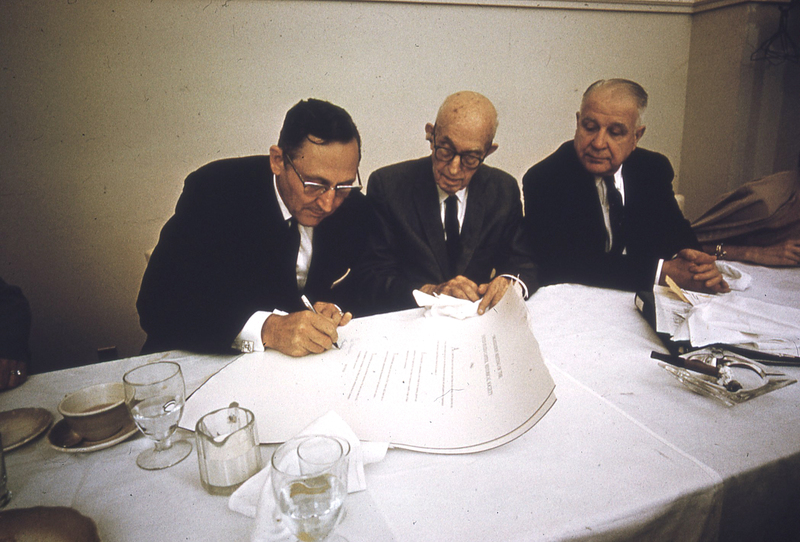 Representative Fred Schwengel (left) signs the Society charter, held by Senator Carl Hayden (center), as Carl Haverlin looks on. Fred Schwengel’s interest in history antedated his congressional service. As a college student-athlete in Missouri three decades earlier, he had heard the famous American poet and biographer Carl Sandburg speak about Lincoln. That experience stimulated his interest in Lincoln, Republican politics, and American history. As a businessman in Davenport, Iowa, he continued to build a collection of books, pamphlets, and art relating to Lincoln that is today housed in a special collection at his alma mater, Northeast Missouri State University in Kirksville. In Congress he initiated the commemoration of the sesquicentennial of Abraham Lincoln’s birth in 1959, and he played key roles in the congressional celebrations of the centennials of the 16th President’s first and second inaugurals. He was also a member of the Civil War Centennial Commission. Given Fred Schwengel’s interest in history it was logical for him to seek out like-minded colleagues. Soon after his arrival he sought to join a historical society but found that none existed in Congress. Research indicated that there had been a short-lived American Historical Society (1835-1840) on Capitol Hill, whose president had been Congressman John Quincy Adams, but none had been organized since that time. He held several conversations with friends in the history community, including Allan Nevins, Carl Sandburg, and University of Maryland History Professor Walter Rundell. Schwengel had also developed a friendship with Speaker of the House Sam Rayburn who was equally devoted to the Capitol and its history. As Fred retold the story, one Saturday morning over breakfast in the House restaurant, he had been lamenting the lack of a historical society when Rayburn interrupted, “By damn, let’s do something about it.” It was from that abrupt but pragmatic suggestion that the July 17, 1962 meeting later developed. It seems to me that the millions of people, adult and youth, who come here need somehow to be helped while they are here to catch something of the fire that burned in the hearts of those who walked and talked in these halls . . . It seems to me that we must try to do a better job of educating our people on these things. Representative Marguerite Stitt Church of Illinois then moved that an organization, either chartered as a non-profit group under the laws of the District of Columbia or chartered by act of Congress, be established “for the purpose of presenting information about the Capitol and the work done therein.” The resolution was unanimously approved, as was a motion by Dr. Richard Howland of the Smithsonian Institution to name the organization the United States Capitol Historical Society. Senator Carl Hayden of Arizona, who was present, was named honorary chairman, and Rep. Schwengel was appointed chairman of a steering committee to present recommendations on the form of the permanent organization, its officers and objectives. In the ensuing weeks the founders of this fledgling endeavor reached decisions that would shape the future of the organization. A membership committee meeting on July 26, 1962, addressed the basic question of financing—would the Society be self-supporting or would it rely upon congressional appropriations? The memorandum of the meeting records their decision: “It is the sense of your Committee that the objectives of the Society could best be achieved if it were self-supporting.” The recommendation to avoid government subsidization had originated earlier from conversations with Senator Hubert Humphrey, who had argued that congressional funding would jeopardize the Society’s nonprofit status and its independence of action. The membership committee believed that the Society could be privately financed through a combination of grants, membership fees, and sales receipts. 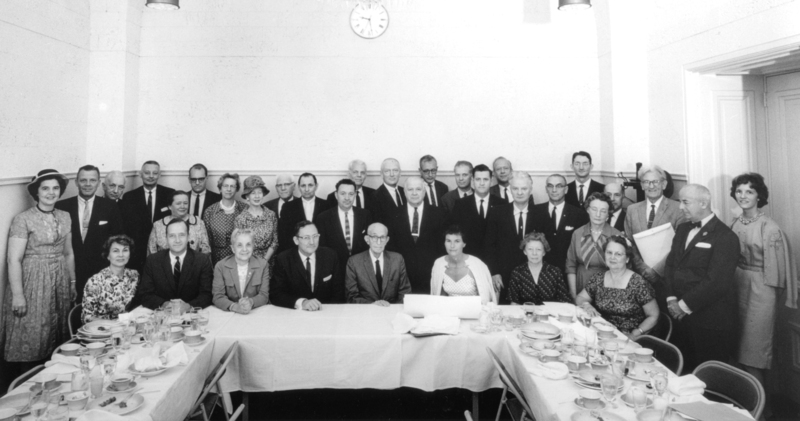 Founding members of the United States Capitol Historical Society posed for a photograph following the July 31, 1962 organizational meeting. Representative Schwengel and Senator Hayden are seated at center. Mr. Speaker, the Capitol Historical Society, by the will of those who created it and the Constitution already adopted that now governs it, proposes to become the most open, the most integrated, the numerically largest, and the most democratic society of men, women and children in the world and, very likely, in the history of societies. In fact we shall consider ourselves 100 percent organized only when, under certain respective categories, we shall have attained a possible membership of 187 million people, or when we shall have enlisted as members the total population of the United States. . . .
We are to be, of course, a nonprofit society, financed not through Federal appropriation, but through grants from private funds and through subscriptions deliberately planned to be modest and widely attractive. . . . For we want the people of the United States, all our people everywhere, to be themselves learners and scholars, teachers and missionaries of their own great and remarkable history. -The purpose for which the corporation is formed, and the business and the objects to be carried on and promoted by it are to encourage in the most comprehensive and enlightened manner an understanding by the people of the founding, growth and significance of the Capitol of the United States of America as the tangible symbol of their representative form of government; to undetake research into the history of the Congress and the Capitol and to promote the discussion, publication and dissemination of the results of such studies; to foster and increase an informed patriotism of the land in the study of this living memorial to the founders of this nation and the continuing thread of principles as exemplified by their successors. The last clause in this article was inspired by an episode in Representative Schwengel’s life. As a schoolteacher in Kirksville, Missouri, he had been introduced to Harry Truman at a Masonic meeting. Informed that Brother Schwengel was a fellow Baptist and a history teacher, but also a Republican, Truman replied that although some might call him a “goddamned Republican,” he shared an interest in history: “Young man, you’ve gotta know your history if you want to be a good citizen.” Convinced that an appreciation of history was inextricably linked with good citizenship, Representative Schwengel believed that this new society could become a history teacher to the nation. The August 28th meeting also heard a report from the Plans and Program Committee presented by Dr. Howland. The primary goal, the report revealed, was the production of a historical guidebook to the Capitol that would follow the model of the recently-produced guide to the White House by the White House Historical Association. Howland’s report estimated that the Society would need to raise $200,000 to finance publication of the book and to hire a small staff and set up offices. The report also suggested the possibilities of producing an educational film and contributing to the restoration and refurbishing of the Capitol. Officers were then elected: Representative Schwengel was elected president, and five vice presidents were elected, including Representative Marguerite Stitt Church, Senator Hubert Humphrey, and well-known historian and author Allan Nevins. The Articles of Incorporation were filed with the Office of Superintendent of Corporations of the District of Columbia on August 8, and the seal was affixed to the document on October 3, 1962. The first meeting of the incorporators took place on the following day at which time a proposed constitution, largely written by counsel Arthur Hanson, was adopted and the officers were again elected. The Internal Revenue Service ruled on October 17 granting the Society tax-exempt status as a nonprofit organization under section 50l(c)(3) of the Internal Revenue Code. Within the space of three months Fred Schwengel’s dream of a historical society on Capitol Hill had become a reality. A small group of dedicated men and women had taken a concept and created an organization complete with a statement of purpose, a constitution and by­laws, elected officers, a program of publications, and a plan for a self-supporting financial base.